Chatto & Windus, 1973, Hardback in Dust Wrapper. Condition: Very Good - in Good DJ. Edges of DJ somewhat ruffled, especially at the top edge which has several small nicks and chips. Illustrated with colour and B&W photographs. 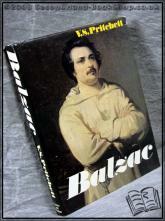 Balzac was one of the founding geniuses among the world’s great novelists and the author has built up a life-size portrait of the man inside the artist, the exuberant, uncouth provincial who combined encyclopaedic knowledge with the life of an exhibitionist and a would-be dandy, a gourmet, a disastrous financial speculator, a successful pursuer of aristocratic women, a born salesman and an untiring traveller. Yet, with some truth, Balzac called himself a monk, working his sixteen hours a day and keeping going on an ocean of strong coffee. When he died, he left the huge monument of the “Comedie Humaine”, an unsurpassed picture of French society from the rise and fall of Napoleon until the revolution of 1848. Size: 10¼" x 7¾". 272 pages.